Front Left to Right: Wes Champan, ATIG; Maria Hoewischer, ATIG; Mallory Zachrich, Zachrich Hop Yard; Lyndsey Murphy, CCFB trustee, Amanda Adelsberger, OFBF. Back Left to Right: Tom Nisonger, CCFB President; Adam Carney, OFBF; Matt Cunningham, Rustic Brew Malt; Nick Zachrich, Zachrich Hop Yard; Kelsey Stief, North High Brewery; Jason McKibben, North High Brewery; Mike Terry, CCFB trustee; and Jamon Sellman, CCFB trustee. 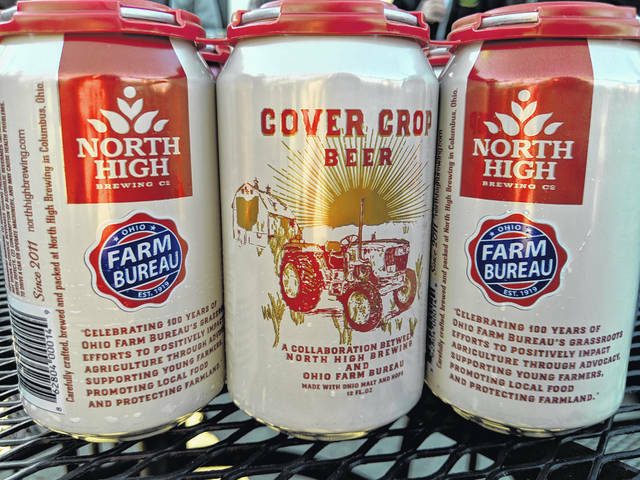 North High Brewing Company’s Cover Crop beer was the official beer of the Ohio Farm Bureau’s Federation centennial celebration this year. 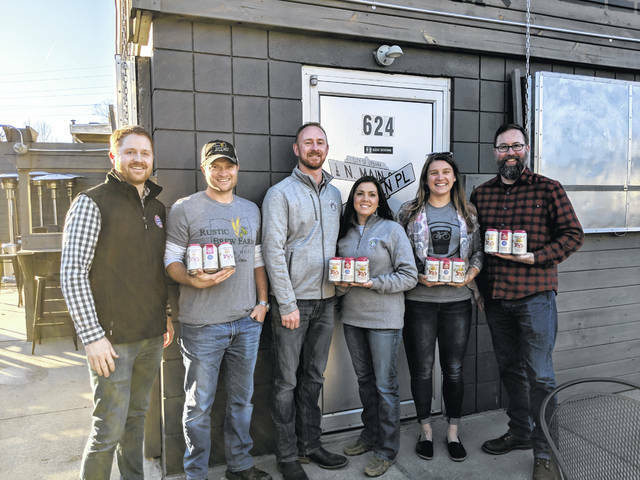 From left are Adam Carney, director of membership sales for the Ohio Farm Bureau Federation; Matt Cunningham, owner of Rustic Brew Farm in Marysville; Nick and Mallory Zachrich of Zachrich Hop Yard in Mechanicsburg; Kelsey Stief; and Jason McKibben, Brewmaster and partner of North High Brewing Company in Columbus. URBANA — If you’re a beer drinker, you may have seen North High Brewing Company’s craft beer, Cover Crop, in your local grocery store. This beer was not only the official beer for the Ohio Farm Bureau Federation’s 100th anniversary, but its ingredients are grown by Ohio farmers. The hops used for the beer come from five Ohio hopyards, one of them being Zachrich Hop Yard & Farm in Mechanicsburg, about 20 minutes southeast of Urbana. Nick and Mallory Zachrich of Zachrich Hop Yard worked with Champaign County Farm Bureau to host the Cover Crop from Field to Pint event at Lincoln & Main gastropub in Urbana on March 26. Representatives from North High, Zachrich Hop Yard, Ohio Farm Bureau, Rustic Brew Farm in Marysville and others attended the event. “(Cover Crop) is not hoppy, not malty, just beer,” said Jason McKibben, brewmaster and partner of North High Brewing Company (North High) of Columbus. “We wanted to make it as approachable as possible.” He added that North High chose to use the Centennial hop variety for Cover Crop because of Ohio Farm Bureau’s (OFB) 100th anniversary and it also has a “floral, delicate aroma but can be strong,” depending on how it’s brewed. Mallory said that this event was intended to promote the beer locally and “Urbana is a good location,” where Cover Crop can be found on tap at Lincoln & Main. North High’s Cover Crop beer is sold in all 88 Ohio counties. McKibben said that at North High they also have hops varieties including Cashmere, a newer type, and Comet, a rediscovered variety. On one-and-one-fourth of an acre the Zachriches grow six hops varieties on their farm, including Cascade, Centennial, Zeus, Cashmere, Willamette and Magnum. They started growing hops almost three years ago in June 2017. Another vital ingredient North High needs to brew beer is grain, or malted barley. Two-thirds of the grain North High uses for their beer comes from Rustic Brew Farm (Rustic Brew) in Marysville, where owner Matt Cunningham grows 130 acres of barley, which is malted after harvest to prepare it for brewing. Cunningham is a fourth generation farmer in Marysville. He and his family also grow corn and soybeans in addition to some hops. They started growing and malting barley in 2014. Adam Carney, director of membership sales for the Ohio Farm Bureau Federation, said that this is a great story to tell and “it’s been a perfect storm.” He was the initial OFB lead working with North High and the other organizations to develop Cover Crop as the official OFB centennial beer. Both McKibben and Carney alluded to the idea of seeing the full circle of the brewing process from working with the malt and hops producers. Hops and malted barley are both cover crops. A cover crop is grown for the protection and enrichment of the soil, including soil erosion, soil fertility, soil quality, water, weeds, pests, diseases, biodiversity and wildlife in an agroecosystem. The cover crop helps clean the water, which is then used to brew the beer. 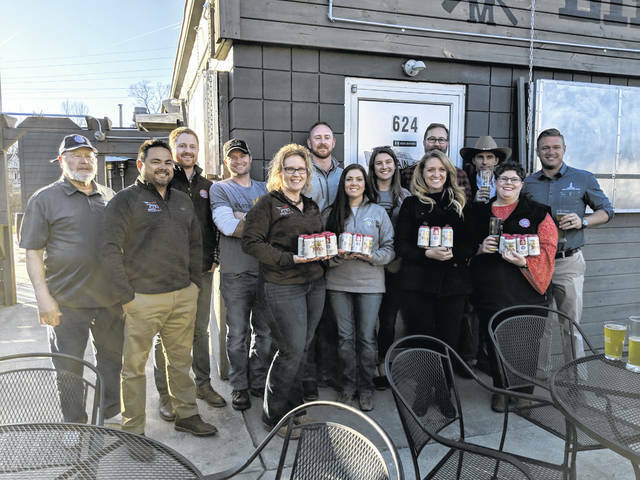 Cunningham said that these partnerships between OFB, Zachrich Hop Yard and Rustic Brew are bridging the gap between urban and rural communities. “Everybody speaks beer,” said Cunningham. McKibben said that the variety of hops they mostly look for is Cascade because it grows well in Ohio and is versatile. “It’s tried and true,” said McKibben. Nick said that mold is a big issue with growing hops, especially with Ohio’s humidity. Hops have to be dried after harvested, which Nick said is half the battle. If they wait too long to dry the hops, they can be become moldy; if they dry them too fast, the hops can become too hot. The Zachriches also sell their hops to Mother Stewarts in Springfield and Roundhouse Depot in Bellefontaine. The couple have agricultural backgrounds, both growing up on family farms. Cunningham said he is planning and projecting to grow Rustic Brew’s malt production. The crash of 2013, when the net farm income began to drop, caused Cunningham to start producing malted barley in an effort to be more profitable. Cunningham built a malthouse, where their grain is prepared and stored for the malting process. “It was either build our own or spend half a million dollars on one from Germany,” he said. Heritage in Marysville helped them build their first malthouse and is in the process of building a second one for Rustic Brew. https://www.rurallifetoday.com/wp-content/uploads/sites/56/2019/04/web1_NorthHighLM1.jpgFront Left to Right: Wes Champan, ATIG; Maria Hoewischer, ATIG; Mallory Zachrich, Zachrich Hop Yard; Lyndsey Murphy, CCFB trustee, Amanda Adelsberger, OFBF. Back Left to Right: Tom Nisonger, CCFB President; Adam Carney, OFBF; Matt Cunningham, Rustic Brew Malt; Nick Zachrich, Zachrich Hop Yard; Kelsey Stief, North High Brewery; Jason McKibben, North High Brewery; Mike Terry, CCFB trustee; and Jamon Sellman, CCFB trustee. https://www.rurallifetoday.com/wp-content/uploads/sites/56/2019/04/web1_NorthHighCentennial.jpgNorth High Brewing Company’s Cover Crop beer was the official beer of the Ohio Farm Bureau’s Federation centennial celebration this year. https://www.rurallifetoday.com/wp-content/uploads/sites/56/2019/04/web1_NorthHighLM2.jpgFrom left are Adam Carney, director of membership sales for the Ohio Farm Bureau Federation; Matt Cunningham, owner of Rustic Brew Farm in Marysville; Nick and Mallory Zachrich of Zachrich Hop Yard in Mechanicsburg; Kelsey Stief; and Jason McKibben, Brewmaster and partner of North High Brewing Company in Columbus.